While sipping on chilled Australian wine you can enjoy the wonder that is a Kata Tjuta sunset. This afternoon enjoy a leisurely drive out to Kata Tjuta (the Olgas) for one of the best sunset experiences in Central Australia. Along the way your Driver Guide will explain the geological and cultural history of the area. 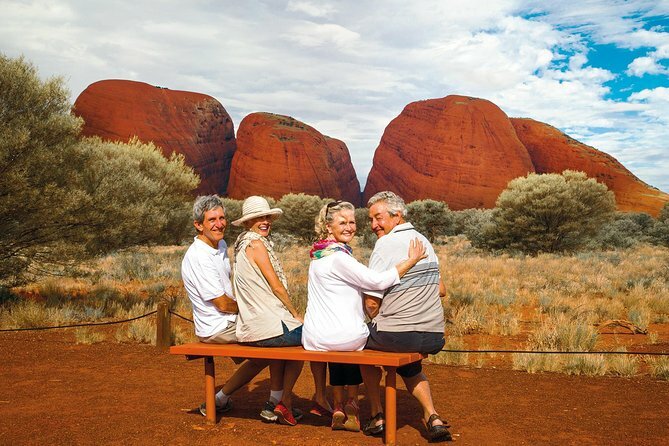 Marvel at the unique flora and admire the view of the central valley of the domes of Kata Tjuta while you take in a magnificent outback sunset with gourmet canapes and Australian wine. Each passing minute brings something new as the domes continue to change color with the setting sun. Your driver guide will return you to Ayers Rock Resort in the early evening. We could not decide whether we wanted to see Uluru at sunrise or sunset. This trip resolved the issue for us as we went on an earlier trip to see Uluru at sunrise and then saw Kata Tjuta in the evening. It gave us variety. We enjoyed canapés and wine as we watched the rock change colours while the sun gradually retreated. We would recommend for people who want a change from Uluru itself. This sunset over the Olgas was beautiful. We were able to get some great photos, and also enjoyed the company of others as we enjoyed bubbly, wine and cheese and lovely dips. A lovely driver and host. Its say half day, actually you just go near Kata Tjuta and stay there for the sunset which occur in the opposite site, so to catch sunset you have to turn your back on the mountains. Wine is average, beer, lemonade and water are available, some chips, cucumber, carrots and 2 sauce... but you cant get closer to the mountain. Not worth it, if you want to see the mountains and have a walk closer, just take the hop/on-hop/off thats available even at sunset. El atardecer es precioso y merece la pena. Los canapés y bebidas bien pero creo que el precio es elevado para lo que es.